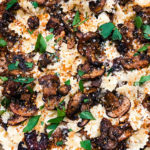 Balsamic roasted mushrooms and fresh garlic get flavorful and incredible before being tossed with a creamy, lemony bowtie pasta topped with toasted breadcrumbs. A divine Meatless Monday (or any day) awaits! In a large skillet, drizzle in about 2 tablespoons of olive oil and the panko bread crumbs, and toast over medium heat. Keep moving the crumbs around constantly so they don’t burn. When they’re all golden brown, transfer them to a bowl to cool. You will most likely have extra crumbs after this is all eaten, so keep the extras in a small airtight container for another use. They keep for up to 2 weeks. Layer the sliced mushrooms and whole garlic cloves in a large baking sheet. Drizzle with a generous amount of olive oil, about 1/4 cup to start. Pour the balsamic vinegar and worcestershire sauce all over the mushrooms. Sprinkle the mushrooms with herbs de provence, a good amount of kosher salt, and black pepper. Toss everything gently to coat. Add a little more olive oil if needed. They shouldn’t be swimming in oil, but none of them should be dry. Use your best judgement. Arrange the mushrooms in a flat layer (it’s ok if some overlap), and roast for 20 to 22 minutes. The mushrooms will shrink significantly, and the garlic will be toasted and blistered. Set aside to cool. Meanwhile, boil your pasta in salted water and cook 4 minutes less than package directions. Example: if they tell you to boil for 14 minutes, you’ll boil for 10 minutes. While pasta is boiling, chop and/or smash the roasted garlic until it’s a paste. Melt the butter in a large skillet over medium heat, preferably one large enough to hold the pasta. Add the smashed garlic, and crushed red pepper flakes. Cook for about 30 seconds, then add the heavy cream. Transfer the undercooked pasta to the heavy cream and roasted garlic, keeping some of the pasta water on hand if needed. Bring the mixture to a boil over high heat, then immediately reduce the heat to medium-low and continue cooking until the pasta is fully cooked through. Note: Adjust the consistency with the pasta water if needed. If your pasta water is too salt, use regular water, adding in 2 tablespoon increments if needed. When the sauce starts to thicken and cling to the pasta, reduce the heat to low, give it a taste, and season with salt, pepper, nutmeg, and granulated garlic. Turn off the heat. The sauce will continue to thicken as it stands. Add the cheese, parsley, and lemon zest. Fold in the roasted mushrooms to warm them through, until combined. Serve with desired amount of toasted bread crumbs, and enjoy immediately. Use any blend or variety of mushrooms that you desire, they all cook the same.